* Margaret Ann CHOATE was born 3 Jul 1844 in Putnam County, Tennessee. 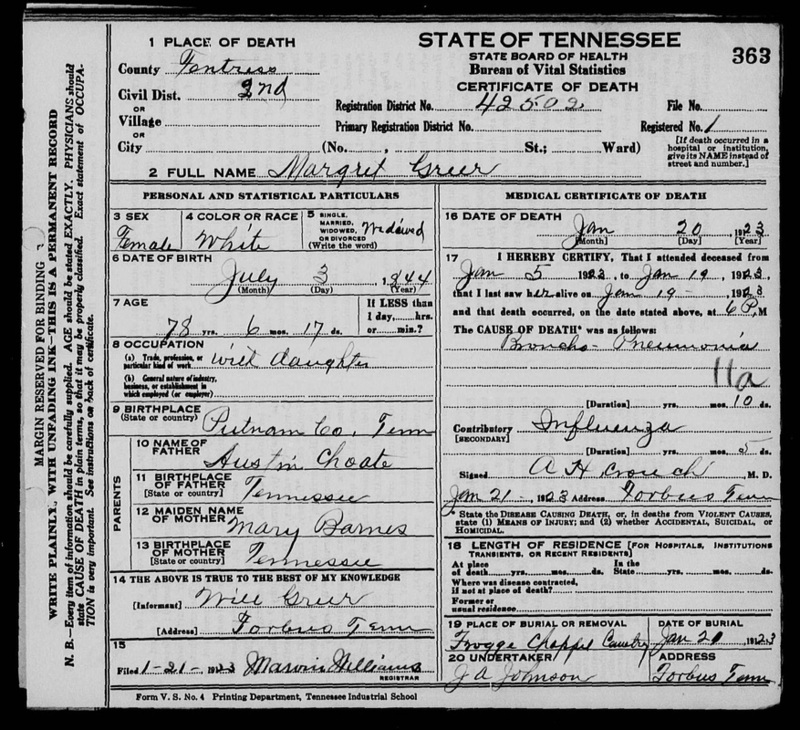 She married John C. Greer on 14 November 1872. Margaret died on 20 January 1923 of Bronchial Pneumonia/Influenze, and is buried at Frogge Chapel Cemetery in Fentress County, Tennessee. Born on 23 February 1832 in Woodbury, Tennessee, and died on 3 January 1907 and is buried in Frogge Chapel Cemetery. THIS WEBSITE IS PART OF AN ONGOING UPDATE OF THE 1966 COMPILATION WRITTEN BY ORLEAN CHOATE ENTITLED "GENEALOGICAL RECORDS OF THE CHOATE FAMILY AND RELATED FAMILIES". PLEASE FEEL FREE TO CONTACT ODIELION@GMAIL.COM IF YOU HAVE ANY CORRECTIONS, SUGGESTIONS OR CONTRIBUTIONS. TO VIEW THE ENTIRE WEBSITE, PLEASE GO TO WWW.CHOATESOFTENNESSEE.WEEBLY.COM .